Channa Dal With Green Capsicum recipe by Nazia Nazar at PakiRecipes.com. 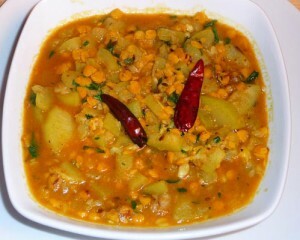 Chana dal with Capsicum is a healthy main dish and has both vegetable and lentil making a wholesome meal. Soak the channa dal in water and keep it for 1 or 2 hrs. In a cooking pan add water, salt and channa ki dal (gram daal) and boil it for 15 to 20 mint . Don't boil much otherwise it will be soft. When the piyaaz is fried take half onions from the pan and put in to other plate. Then half piyaaz which is in pan in that add curry Pata and mix them then add red chilli powder, turmeric , cumin seeds , kolonji, ginger /garlic paste and green chilies and salt . Then take out the curry Pata stick from the pan and add boiled channa dal and then add shimla mirch and mix it..
Then add yogurt and mix it. Then let it simmer for 10 min on low flame and when its ready garnish with garam masala and hara dhaniya serve with naan.